Join us for free small bites and an educational session on how you can help your international real estate clients reach their American dream. 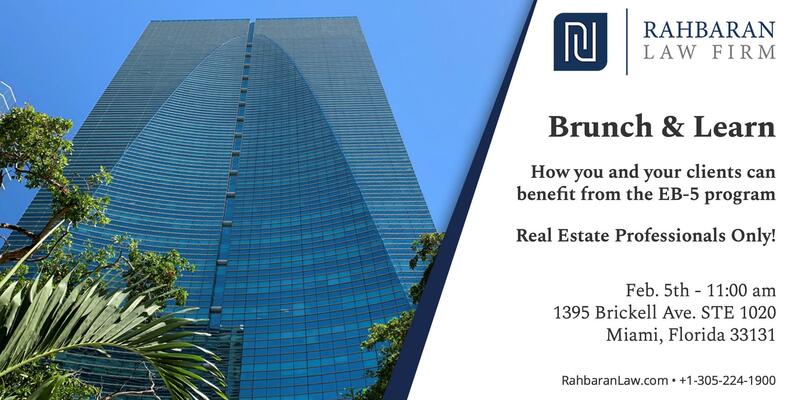 In this educational session, the Rahbaran & Associates team will inform licensed real estate professionals about the EB-5 Immigration and Investor Program. And go through the pathways to USA permanent residency for your international clients. This session will be lead by Reza Rahbaran. Reza is a nationally ranked immigration lawyer year after year and continuously is considered one of the top 25 EB-5 lawyers around the globe. Reza regularly appears on television networks as an EB-5 attorney panelist and is committed to involving and educating the public about the opportunities offered by the EB-5 Investor Program. He is also a faculty member of the District of Columbia bar association continuing legal education program where he speaks on EB-5 immigration matters. Rahbaran & Associates has active memberships in the American Immigration Lawyers Association (AILA), American Bar Association (ABA) and Iranian American Bar Association (IABA).